Dickmann Manufacturing Company, located in Grafton, WI has been synonymous with excellence and on-time delivery in metal fabrication and stampings for over 60 years. The name Dickmann Manufacturing Company has been synonymous with excellence and on-time delivery for over 60 years. 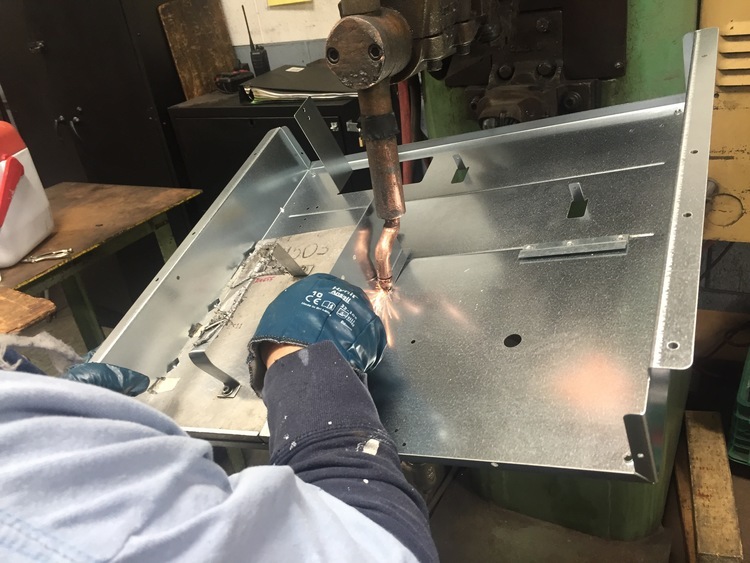 Our metal fabrication and stamping services are known in Milwaukee, Wisconsin and throughout the Midwest for its quality and precision at a competitive price. We take pride in taking a project from prototype to production and our ability to work with a wide variety of material types. As a family owned and operated manufacturing business in Grafton, Wisconsin, it is our goal to partner with our clients to produce the highest quality parts feasible. For decades we’ve served as the metal fabricator and metal stamping supplier of product components for companies across a wide variety of industries. Some of the product components we have manufactured for our customers in the past include sheet metal fabrications and custom metal stamping projects that we have manufactured into different types of brackets, housings, shrouds, and much more. We are confident that with our expertise and ingenuity we can offer your business solutions for virtually all of your metal project needs. Please contact us for more information on how Dickmann Manufacturing Company can help you with your custom metal fabrication and stamping needs today. Having been in purchasing for over 35 years, I’ve dealt with a lot of companies, but I can honestly say I have never worked with a group of people so in tuned to customer service and quality as the folks at Dickmann Mfg. in Grafton. My company makes a high end product that commands attention to details and that is what I get from this metal fabricator. They are competitively priced and deliveries are on time. I only wish I had more suppliers like this. There are many stamping and metal fabricators out there, but Dickmann Mfg. has proven themselves a cut above the rest. Their dedication, know how, forward thinking, and quality has shown in every task they take on for us. No matter the challenge, be it a complex part, unique material, or an unrealistic timeline, the staff at Dickmann Mfg. have overcome any obstacle, and do it for a very competitive price. With my 20 plus year experience in purchasing, I could only wish that all my suppliers were as easy and skilled as Dickmann Mfg. Metal fabrication and stamping has been in our roots since 1957 when Jerome and Alice Dickmann founded Dickmann Manufacturing Company in Grafton, Wisconsin. To this day we remain family owned with over 50 dedicated people who share our passion for servicing a diverse group of customers in the metal fabrication and stamping industry. Hard work and strong family values along with our founding principles have served us well and continue to be the cornerstones of our business model today.